velo2bike® for who ? For you ? 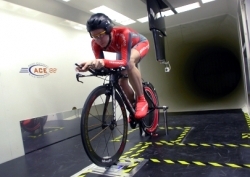 Within the scope of testing and performance enhancement (bikefitting, aerodynamics .. ) the understanding and ready use of the specific technical vocabulary and jargon (in both french and english) is fundamental to achieving your aims. For professional and amateur racers who, at the end of their racing career, are looking for a new direction though within the cycling world. You may want to become a trainer, a DS or wish to develop a line of cycling clothing (e.g. Laurent Jalabert's Hors Cat�gorie www.horscategorie.fr or Hincapie www.hincapie.com or Geoffrroy Lequatre's G4 www.g4dimension.com) or branch into the sale of cycling accessories www.velopuissance.com. Whatever, in all cases, your communication in perfect french is essential if you wish to pierce the french market.